The remains of the South Agora dating from the 3rd century BC are to the south of the North Agora and the Bouleuterion. 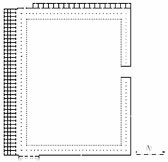 Its plan dates back to the times of Antiochus I (280-261 BC) and involved the abolition of 20 building blocks of the Classical city, that is 120 houses, in order to provide public space to accommodate events of the political, economic, religious and social life of the city.It spread over 127X161 metres, and is one of the largest agoras of ancient Greek cities excavated so far. The South Agora included a large rectangular open-air space surrounded with stoas and shops. Entrance to the open-air space of the Agora was through the west, south and north sides. The west gate was a simple opening near the centre of the west side of the Agora. The south gate was on the south-east corner of the building complex, and in Roman times was a simple, wide, vaulted entrance. Up to late Hellenistic times, the north gate of the South Agora consisted of a stoa with Doric columns, among which there were three gates In the years of Hadrian (117-138 AD) the northern entrance to the Agora was adorned with a monumental two-storey propylon. According to an inscription from Didyma, the North Agora was devoted to Delphinios Apollo by Antiochus I, son of Seleukus I. 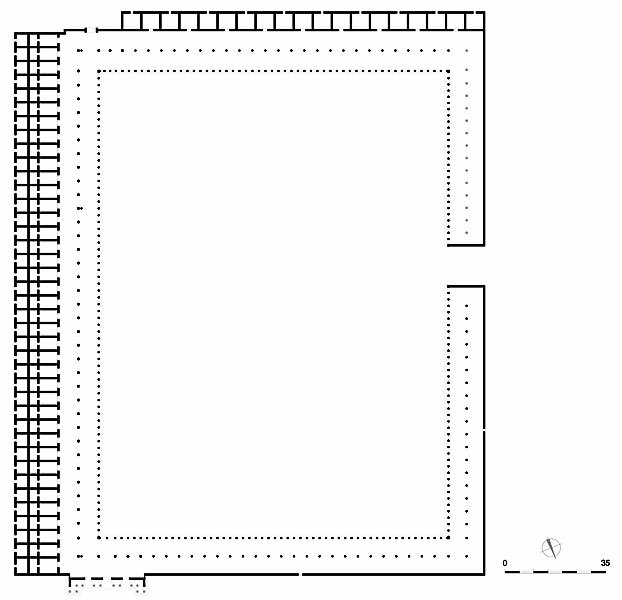 Its East Stoa, which belongs to the earliest building phase of the Agora, measured one stadium long. 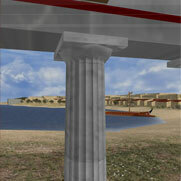 The Stoa consisted of a Doric colonnade of columns. Behind the colonnade and parallel to it stretched a series of seventy-eight three-room shops whose entrance was through both the open-air area of the Agora, through the stoa, and from the outside, that is from the east. During the Imperial period, a colonnade of Ionic and Corinthian columns was added to the interior of the single aisled stoa, turning it into a two-aisled stoa. Statues, which were offerings from illustrious persons, were placed in front of the interior colonnade. The north, south and west sides of the South Agora were surrounded by two two-aisled stoas. A series of single-room shops stretched behind and parallel to the south wing of the South Stoa. Their entrances were alternately towards the stoa and the street which passed parallel to the south side of the Agora. In the middle of the 2nd century BC the Large Warehouse was built, which was in direct functional relation with the South Agora. The project “Mediterranean Harbors – Ships and the Sea: The Invisible Routes” was co-funded by the European Regional Development Fund and National Funds of Greece, Cyprus and Italy, in the framework of INTERREG ARCHIMED COMMUNITY INITIATIVE PROGRAMME INTERREG III B ARCHIMED 2000-2006.